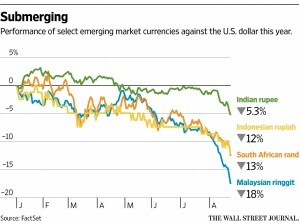 Growing anxieties about China cause investors to pull money from developing markets. Bad news from China has sparked a firestorm in the developing countries that feed its vast industrial machine, leaving a swath of economies with few good ways to escape a crunch. In Indonesia, coal once bound for China is piled up in port. In South Africa, mines that fed China’s voracious demand for metals are firing workers. In financial markets, investors have responded by pulling out. On Monday, the currencies of Russia, Indonesia, South Africa, Brazil and other commodity exporters tumbled to multiyear lows against the U.S. dollar. Stock indexes collapsed. The Russian ruble hit a seven-month low Monday, and by the end of the main trading session in Moscow it slid to its weakest-ever closing level of 70.9 to the dollar. A year ago, a dollar bought only around 36 rubles. The weak currencies in these economies present a glum dilemma: Raise rates to defend them, and the economy takes a hit from tighter credit; let them fall, and inflation erodes household budgets. Meanwhile, dollar-denominated debt becomes a bigger burden for many cash-strapped governments and companies. The blowout in Russia is emblematic of the fragility of economies relying on high raw materials prices supported by China’s long-sturdy demand—and of the tight constraints faced by those countries’ policy makers. Chinese woes helped trigger a plunge in the price of Russia’s principal export and main source of foreign-currency income, crude oil. That, in turn, has pummeled the ruble. Russia is doubly vulnerable because it has turned to China as relations with the West have soured over the past two years. Russia is the second-largest supplier of oil to China, after Saudi Arabia, and Moscow has sought to increase trade and investment ties with China, especially in its big energy projects. Large chunks of the emerging world have staked their growth on supplying China. “There are piles of coal in ports,” said Supriatna Suhala, executive director of the Indonesian Coal Mining Association. Big coal miners, he said, have sent workers home to make ends meet. In Thailand, a major supplier of rubber to China’s tire factories, Perk Lertwangpong, a rubber farmer and former president of the Rubber Planter Cooperatives, said he expects exports to fall by a fifth in 2015 compared with last year. Indonesia, which sells coal, minerals and palm oil to China, was riding high not long ago. Economic growth in 2012 was around 6%. This year, the stock market is down more than 20%. Its currency, the rupiah, is down 12.5% for the year and is hovering at its lowest level since the Asian financial crisis that began in 1997. Latin America, too, rode the coattails of surging Chinese demand for commodities like soybeans, copper and iron ore during the past 15 years. The peso currencies in both oil-exporting Mexico and Colombia hit record lows on Monday. In South Africa, the rand on Monday plummeted to all-time lows of beyond 14 to the dollar. Inflation is rising. Economists warn growth could miss already-lackluster forecasts, leading to a second consecutive sub-2% expansion this year. Yet South Africa’s central bank raised rates last month to bolster its currency despite economic distress. Hardest hit are the gold, platinum and iron mines whose riches built South Africa into the continent’s most developed economy. Beijing’s demand for those metals pushed China past the U.S. as South Africa’s top trading partner in 2009. The reversal since then has been severe. “At the end of the day, it’s affecting everybody,” he said of the turmoil emanating from China.